Written in 1836 by Frédéric Bérat, on a boat trip from Rouen to Sainte-Adresse, Ma Normandie has been adopted as the popular, though unofficial, anthem of the region of Normandy in France. 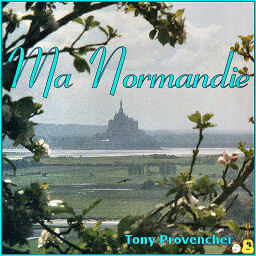 Up until 2007, Ma Normandie was, oddly enough, the official anthem of the Island of Jersey, a British Crown Dependency! Read the complete story at: Ma Normandie et Moi. The land that gave to me the light of day. And the gondoliers of Venice too. That brings an end to reveries.